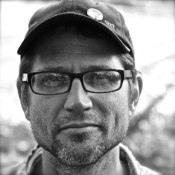 Several recent events at or involving Green Gulch Farm have underscored both the concern felt at Zen Center for the environment and the wonderful partnerships forged by leaders at Zen Center to express that concern. Here are a few notes about what has been going on, with links to related content. 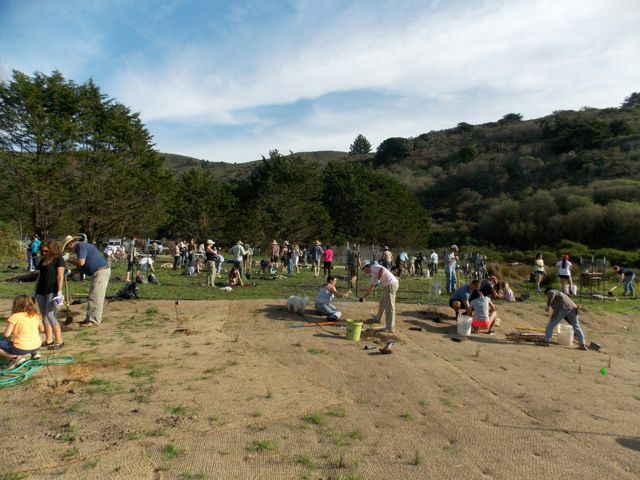 Last Sunday’s Arbor Day/Restoration Day at Green Gulch was a wonderful day�spent recognizing the privilege and responsibility of being stewards of the land, in both formal and practical ways. After a Zen ceremony celebrating the nearly finished Creek Restoration Project, a group of over 100 volunteers, including many children, residents, practice period students and extended sangha members, worked to plant hundreds of California natives, perennials, and shrubs along the newly recreated meandering banks of Green Gulch Creek. The effort was directed effortlessly by STRAW (Students and Teachers Restoring a Watershed), a program of Point Blue Conservation Science, headquartered in Petaluma, CA. The timing of Arbor Day at Green Gulch coincided with a “Preach-In” on global warming that weekend, an opportunity for Zen Center as a faith-based organization and member of California Interfaith Power and Light (CIPL) to join other congregations around the country in a concerted effort to highlight environmental issues. In addition to the plantings during Arbor Day, another environmental project on Sunday involved Green Gulch’s honeybees. 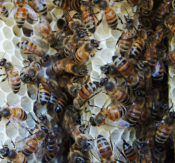 Michael Joshin Thiele, a former Green Gulch resident who teaches apiculture, is helping to organize an effort to create a honeybee sanctuary at Green Gulch, using both wild and managed bee hives. A status check of the hives Sunday produced favorable news for the project (more details here), ahead of Michael’s introductory workshop on a bee-centered approach to apiculture on Saturday, February 28, titled Biodynamic Apiculture: Supporting the Life of Bees. We have gathered at the bank of the restored lower section of the Green Gulch Creek on this beautiful, clear-skied, sunny, late-winter afternoon to celebrate and bless the restoration of this creek and the surrounding riparian habitat. We rejoice at the work of restoring this creek, mysterious and unnameable, an ancient waterway that teaches the Way, flows into the ocean, and with its native fragrance calls to the salmon on their journey. We offer our gratitude to all those who have contributed to this project, including our state and national government, the scientists, planners, designers, and builders of the Prunuske-Chatham Environmental Consulting Firm, a wide array of volunteers, and the past and current donors and residents of this temple and all of San Francisco Zen Center. We acknowledge any harm we have done to the seen and unseen inhabitants of this land during the course of this work and express our sincere sorrow for our harmful actions. We invite all the fish, birds, mammals, reptiles, amphibians and invertebrates that live here and depend on healthy watersheds to come here for sustenance and nurturing, including coho and steelhead salmon, great blue herons, great egrets, snowy egrets, California quail, Swainson�s thrushes, red-tailed hawks, tree swallows, kingfishers, Wilson�s warblers, great-horned and spotted owls, river otters, deer, foxes, possums, skunks, raccoons, bobcats, mountain lions, western pond turtles, red-legged frogs, newts, salamanders and many, many more. And may the restoration of this habitat renew us in our vows and promote great peace and blessing for all beings. Photo credits: Arbor Day 2015 photos by Mary Schjeldahl; Green Gulch Creek meandering in its new bed before planting (2014) by Sara Tashker; bees by Michael Joshin Thiele.